A little reminder of the incredible fashions that hit the runways earlier this year comes very handy when you need to run out and get your summer fashion fix. Take some inspiration from the masters who set the trends, and buy something reminiscent of their inspiring collections. 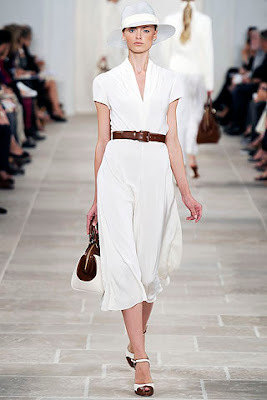 Ralph Lauren's 2009 RTW had us dreaming of adventure in the African Safari. A beautiful mix of Khakis, Golds, Brown and Whites brings luxury to a classically sporty look. Continuing with the trend that most designers were on this season, Ralph Lauren also took us back in time to the 1930's, and the rise of Hollywood Glamour. This collection is a favorite for summer, its beautifully relaxed, very flirtatious, and so easy to put together.